In this Article we tell about top css color tools. these tools are very usefull fol color schema. If you wish to design your WordPress blog’s appearance by yourself, you can rely on CSS. Here are 6 useful CSS color tools that could help get you started. 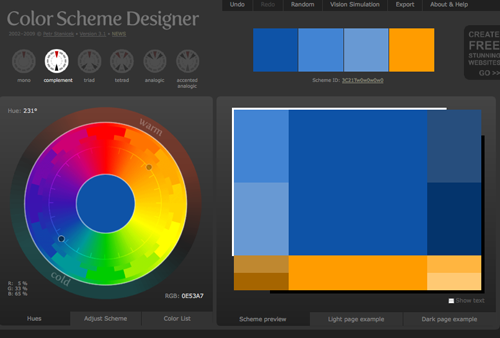 Color Scheme Designer provides colors in color wheel form. It has different color variations in percentage ratio like mono, tetrad, triad, analogic, accented analogic and complementary. This is especially useful in creating color combinations that work. This gradient editor and generator tool allows you to make CSS gradients with cross-browser support. It has a Photoshop-like interface, opacity support with opacity stops, import from image and existing CSS, flexible preview panel, over 135 gradient presets and more! With this tool, you can select any color from the color picker then copy its hexadecimal value from the bottom field. It also has 2 options which you can provide the RGB and hexadecimal color codes. Colors Palette Generator allows you to upload any image you want for generating and using a color palette based on the image’s primary colors. This tool offers over 16 million colors with both RGB and hexadecimal color modes. Gradient Image Maker creates gradient images that you can use in your website’s template design. It lets you generate 3 types of gradient images with instant previewing. This entry was posted in CSS and tagged Color Scheme Designer, Colors Palette Generator, CSS, CSS2, Gradient Image Maker, RGB on October 12, 2012 by Ramesh. by Ramesh Chander. Rating - 5.0 out of 5. Hello, i believe that i saw you visited my web site thus i came to return the desire?.I am trying to find issues to enhance my website!I guess its ok to make use of some of your concepts! !